MELBOURNE, Australia — No tirades at the umpire. No insults directed at spectators. No rackets smashed to smithereens. For Nick Kyrgios, the talented yet combustible bad boy of tennis, it was a rather routine 6-1, 6-2, 6-2 win over Portugal's Gastao Elias in the first round of the Australian Open on Monday. But given the way the Australian imploded at the end of last season, drawing intense criticism and a brief suspension from the sport, an ordinary match without fireworks might be a good thing. The No. 14-seeded Kyrgios played with focus and composure against Elias, the kind of self-control many Australian fans wish he displayed in every match. Playing with a sore left knee, which has bothered him since the beginning of the year, he ended points quickly and conserved his energy throughout the encounter, getting off the court in a swift 85 minutes. "If you happen to go deep, it gets pretty tiring," Kyrgios said. "So you just want to reserve that mental energy and other parts of your body as well. The quicker you can get it done, the better it is for deeper in the week." The Australian player didn't sound quite as thoughtful in his last news conference of 2016. His season came to an abrupt end at the Shanghai Masters in October when he sped through a match against Mischa Zverev with little effort or apparent care whether he won or lost. 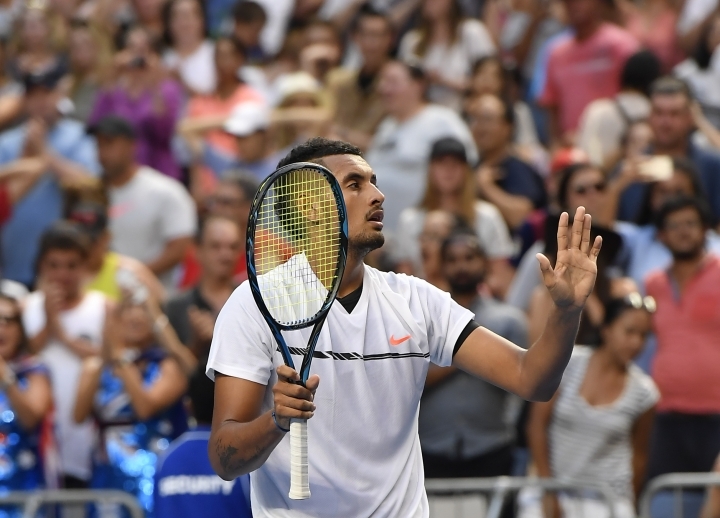 At one point, a spectator challenged his professionalism and Kyrgios responded with vitriol, inviting the man to switch places with him on court. Tennis officials told Kyrgios to leave instead. In a harsh response, the ATP Tour handed him more than US$40,000 in fines and an eight-week suspension that was later reduced to three when he agreed to consult with a sports psychologist. 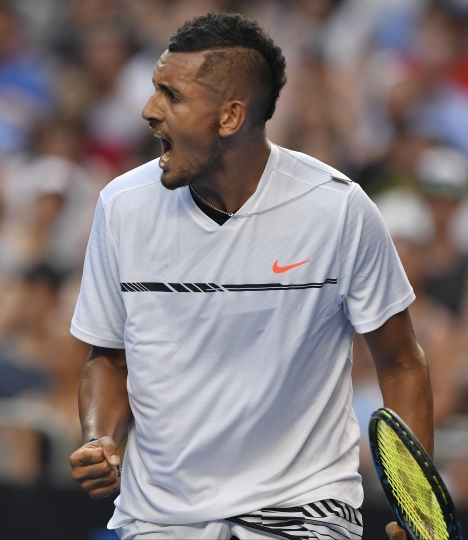 On Monday, Kyrgios admitted he had been struggling to maintain his morale at the tail end of a tiring season. "It's hard for me to stay happy on the road," he said. "I get homesick quite easily. It's not easy being away from your home, being away from your girlfriend. I just wanted to be with them." He's playing in front of a home crowd now, including family and friends who had traveled from his hometown of Canberra, the Australian capital, to watch him play. Will it make a difference? Kyrgios seems to think so — and he believes he's due for a breakthrough at a Grand Slam after reaching the quarterfinals at Wimbledon in 2014 at the Australian Open the following year. "I just want to get back to it and try to have fun again," he said. "I know I can do well at these tournaments. My level has been great all the last year. I'm 13 in the world. I'm not in a bad space. Try and be positive, try and enjoy myself."